In this pAsuram, mAmunigaL is following AzhwAr’s pAsurams of giving instructions to samsAris (worldly people) on emperumAn’s saulabhyam which extends up to his archAvathAram and is mercifully explaining it. AzhwAr thought “My giving up on these worldly people is like beating those who are already falling down, with a stick” about the loss of those who were despised by him, and out of overwhelming compassion, instructs emperumAn’s saulabhyam to them by mercifully explaining his para (supreme form in paramapadham), vyUha (his form in kshIrAbdhi), vibhava (incarnations) etc in proper order; further he explains “as you consecrate a form as per your desire, out of his great simplicity, he shows great affection for those forms similar to the desire he has for his divine forms in paramapadham, he mingles with you all and fulfils all your desires; so you surrender unto the archAvathAram of emperumAn” in thiruvAimozhi 3.6 “seyya thAmaraik kaNNan“; mAmunigaL mercifully explains the essence of it, starting with “seyya paraththuvamAy“. AzhwAr who is having the thamizh vEdham, which is well analysed along with chEthanas, as his identity, mercifully explained that for those who surrender, in this material realm, among the distinguished parathvam, great vyUha, pure vibhava etc forms, deity forms are easy to approach. seyya paraththuvamAy – As said in SrIvishNu purANam 1.2.12 “para: parANAm parama:” (the most supreme), beautiful parathva which is distinguished than all other entities. sIrAr viyUgamAy – vyUham is as explained in hari vamSam “Esha nArAyaNaS SrImAn kshIrArNava nikEthana:” (SrIman nArAyaNa who is residing in the milk ocean) – sIr indicates qualities and opulence. thuyya vibhavamAy – Incarnations which have the purity of being enjoyable physically. parathvam etc are mercifully explained in this decad in “seyya thAmaraik kaNNan” (reddish lotus-eyed emperumAn) [1st pAsuram], “amarar kula mudhal” (the lord of nithyasUris) [9th pAsuram], “thadam kadal kidandhAn” (one who is reclining on the vast ocean) [2nd pAsuram], “aravamERi alai kadal amarum thuyil koNda aNNal” (the lord who is climbing and resting on the serpent bed in the ocean) [3rd pAsuram], “then ilangai eri ezhach cheRRa villi” (the archer who destroyed lankA by setting it on fire) [2nd pAsuram], “dhayaradhaRku magan thannai” (son of dhaSaratha) [8th pAsuram], “kuravai kOththa kuzhaganaik kudak kUththanai maNivaNNanai” (the one who danced with gOpikAs by easily mingling with them, who danced with the pots and who has dark gem like complexion) [3rd pAsuram]. eydhumavarkku innilaththil – For those who approach him and surrender unto him in this material realm. 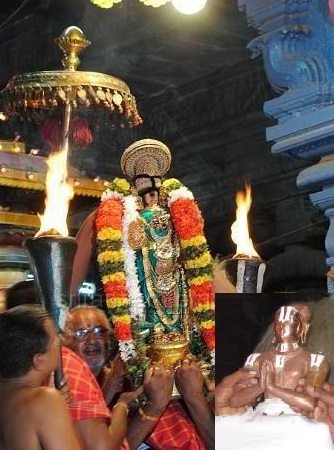 archAvathAram eLidhenRAn – AzhwAr is saying that archAvathAram is very easy to approach due to emperumAn’s saulabhyam (easy approachability), being visible to the eyes and being present eternally. mAmunigaL is thinking AzhwAr’s words “nenjinAl ninaippAn yavan avanAgum nIL kadal vaNNan” (one who is in the form of the vast ocean, assumes the forms desired by the heart of his devotee) [9th pAsuram]. In AchArya hrudhayam, nAyanAr explained that manifesting his ultimate saulabhyam in archAvathAram to make the incarnations as said in “eLivarum iNaivanAm” (appearing in all forms and mingling with all) appear to be like parathvam when compared to archAvathAram. As said in SrI rAmAyaNam ayOdhyA kANdam 6.4 “SrImathyAyathanE viSNOSSiSyE naravarAthmaja:” (Meditating upon lord vishNu in his beautiful temple, SrI rAma slept there) and SrI rAmAyaNam ayOdhyA kANdam 6.1 “nArAyaNam upAgamath” (meditated upon nArAyaNa), archAvathara emperumAns have the greatness of being worshipped by his own incarnations. mAmunigaL is revealing the identity of the one who brought out the greatness of archAvathAram in this manner. pannu thamizh mARan payinRu – That is AzhwAr who is having the thamizh vEdham which is well analysed along with chEthanas, as his identity. As he revealed the ultimate pramANam (authentic text) in thiruvAimozhi 2.7.3 “paNNiya thamizh“, AzhwAr is said to have mercifully revealed archAvathAram to be the essence of pramEyam (goal, emperumAn’s forms). This entry was posted in Other, thiruvAimozhi nURRandhAdhi on December 31, 2018 by Sarathy Thothathri.